What about the Quran's verses of Peace and Tolerance for other religions? While there are some verses in the Quran (and episodes from Muhammad's life) that would appear to promote tolerance and peace, they are usually mitigated by circumstances and context. Closer examination proves less convenient to the simplistic interpretation furnished by apologists - which usually tells us more about what some Muslims wish were there rather than what actually is. Coexistence as equals was something that Muhammad promoted only when he did not have the power to conquer. In the full context of the Quran, 'peace' means submission, and 'tolerance of other religions' means not killing those members who agree to live in a subjugated status to Islamic rule. Quran (2:208): O You who believe! Enter absolutely into peace [Islam]. This is a mistranslation. The Arabic word is "Islam." This is not the same as "peace," which is salaam. The verse is actually a call for Jews and Christians to embrace Islam - not an exhortation for Muslims to be peaceful. In fact, verse 193 tells the faithful to fight "until worship is for Allah alone." Quran (2:62): Those who believe and those who are Jews and Christians, and Sabians, whoever believes in Allah and the Last Day and do righteous good deeds shall have their reward with their Lord, on them shall be no fear, nor shall they grieve. Taken by itself, this verse indicates an extraordinary tolerance for Jews and Christians (Sabians were a very obscure Middle Eastern sect that Allah curiously chose to mention in place of, say, a religion like Hinduism with hundreds of millions of followers but unknown to Muhammad the "messenger"). The verse would seem to indicate that Jews and Christians will be admitted to heaven and, thus, should not be discriminated against by Muslims here on earth. Unfortunately, the truth is that this verse was narrated at a time when Muslims did not have the power to fight Jews and Christians. Muhammad needed to stay in the good graces of the Jewish tribes at Medina. Once Muslims obtained power, things changed - as did the Quran's view of other religions. Abrogation, the "substituting of one verse with another" is an important tool in resolving the Quran's contradictions. Had the tolerant verse, 2:62, been narrated last, then it might be argued that it overrides the many other verses that curse and condemn Jews and Christians (3:110, 5:13, 5:17, 5:73...) and call for their subjugation(9:29). Unfortunately, it is the intolerant verses that supersede 2:62, both in their abundance and chronological sequence. So, the apologist who quotes this verse out of context is either telling you what they want to believe or what they want you to believe - but not what the Quran as a whole actually teaches. Quran (2:256): There is no compulsion in religion. Well... except when there is, as the Quran later prescribes. This verse is addressed in a separate article here. This verse explicitly applies to the killing of a believer (someone who is Muslim). The omission of non-Muslim life is highly conspicuous. A religion that forbids members from deliberately killing each other is hardly breaking new ground or setting a high moral mark. Other religions and moral systems generally apply the worth of human life universally. Although this verse would appear to say that one should not be influenced by their hatred for others, it is actually speaking of the hatred that others have for them. The arabic word qawmin refers to something belonging to another people. The same word is used in verse 5:77 of the same sura in reference to the "desires" of others. It is obviously not referring to a desire for others, just as verse 8 is not speaking of a hatred for others. As verse 6 makes clear, the "doing justice" spoken of in verse 8 means performing a religious duty (prayer, ablution...). In fact, much of the rest of Sura 5 speaks very poorly of Jews and Christians specifically. Nowhere does it say to treat them justly, but it does tell Muslims to shun them (5:51) or risk being labeled an apostate. So, properly translated, verse 8 would read: "do not let other people's hatred cause you to deviate from performing [religious rituals] for Allah." When presented, this verse is almost always redacted to say "if anyone killed a person it would be as if he killed all mankind". The full reading (including the verse that follows) conveys a much different meaning. This is addressed in a separate article here. This verse is sometimes quoted to support the argument that people of other religions will be accepted by Allah as long as they are 'righteous'. The verbs used in the verse are actually in the past tense, meaning that the reference is to Jews and Christians who existed prior to Muhammad. This is important, because the full context of the passage shows that the rules have changed. Christians and Jews who believe in their own religion are explicitly condemned to Hell in this passage, as well as others in the Quran (98:6). This verse is quoted by apologists who argue that it is "completely against Islam" to offend believers of other religions. To their credit, many sincerely want this to be the case. However, it blatantly contradicts other parts of the Quran, which openly insult Christians, Jews, and polytheists and their gods. The Quran mocks Christians for believing in the divinity of Jesus, slanders Jews in the worst sort of way, and is so hostile toward polytheists that it not only mocks their gods but even says to kill those who worship them in the course of chasing them from their homes (in Arabia). The contradiction is easily explained by historical context. Sura 6 is from the Meccan era. This means that it was narrated at an early time when Muslims were weak and did not have the power to challenge other religions. Their survival depended on appearing peaceful. The many other verses of the Quran which insult non-Islamic religions and non-Muslims alike were narrated after this when Muslims did not need to rely on the tolerance of others. In other words, the message of the Quran evolved along with the status of Muhammad's people. Once he had the power to do so, according to the Hadith and Sira, Muhammad evicted Jews, made war on Christians, and destroyed idols. Subsequent Muslim conquests almost always involved turning other houses of worship into mosques - such as the Hagia Sophia in Turkey. Taken in isolation, this verse seems to say that Muslims are to be peaceful toward those who are peaceful to them. This life principle would appear to be self-evident, but it seems that the moral bar is set fairly low in the Quran. If this means that Muslims are to live peacefully and not expand their religion via military force, as some suggest, then the lesson was completely lost on Muhammad's own Companions, who did exactly the opposite. Most likely, this is because they kept the verse in context. The verse prior to this, 8:60, says to "make ready against them all you can of power, including steeds of war to threaten the enemy of Allah and your enemy, and others besides whom, you may not know but whom Allah does know." Who is that Muslims are to prepare for war against? Verse 55 says it is the unbelievers, who are lower than animals: "Verily, The worst of moving (living) creatures before Allah are those who disbelieve". The verses between tell Muslims that they cannot trust unbelievers and to punish them "severely" in war. If treachery is suspected at any point after non-Muslims are subjugated, then Muslims are to break the covenant and attack the "enemies of Allah" and (somewhat chillingly) "others whom you may not know". But other than that, it's all about peace! Quran (17:33): And do not kill anyone which Allah has forbidden, except for a just cause. This is one of those verses that sounds better from a distance. What it literally says is that you aren't supposed to kill people that you aren't supposed to kill... unless it's for a good cause (in which case it's game on). In fact, one could reasonably argue that since it implies that there is already a list of forbidden targets, the verse exists mainly to provide an exception to the rule. So, who is it "forbidden" to kill and what constitutes a "just" cause? The only group that the Quran explicitly forbids killing intentionally is believing Muslims (and, more tenuously, dhimmis who pay the jizya). The greatest cause of all, according to one of the Quran's last (and most violent) chapters, is that Allah's religion be superior over all others (9:33) - which happens to coincide perfectly with what Islamic terrorists say is their supreme goal. Verse 17:33 thus provides divine justification for Islamic terror in which even innocent victims are collateral damage. Does this sound like peace and tolerance? Quran (24:22): And let not those among you who are blessed with graces and wealth swear not to give (any sort of help) to their kinsmen, Al-Masakin (the poor), and those who left their homes for Allah's Cause. Let them pardon and forgive. Do you not love that Allah should forgive you? Part of this verse tells one to forgive as they want to be forgiven by Allah. Certainly, there is nothing wrong with this, but, as usual, there is bit more to the story. The historical context of the verse is an episode known as "Ifk," in which Muhammad's favorite wife, Aisha, was accused of infidelity. Muhammad felt the accusation was false and (not surprisingly) so did Allah - who copiously vowed eternal damnation and a lifetime of curses for the accusers. In fact, the main theme of Sura 24 isn't forgiveness, but condemnation for those who falsely accused his chaste wife of sexual impropriety. So what of verse 22? It was a relatively obscure instruction to a group of comparatively wealthy Muslims not to withdraw financial support for the entire group of Muslim emigrants which had produced the accusers. Quran (39:10): Say (O Muhammad ): "O My slaves who believe, be afraid of your Lord and keep your duty to Him. Good is (the reward) for those who do good in this world, and Allah's earth is spacious!" The last part of this verse ("Good is the reward for those who do good") is sometimes extracted from context and said to mean that anyone who does good will be rewarded regardless of their religious belief. This venture in cherry-picking is refuted by surrounding text as well as other parts of the Quran. The "good" that one is supposed to do is not defined in verse 10. A naïve reader would probably project their own values and assume that this means acts of unselfishness. An astute reader would look at the surrounding text and discover that it actually refers to Islamic belief and worship (as verse 9 puts it, "one who is obedient to Allah, prostrating himself or standing (in prayer) during the hours of the night, fearing the Hereafter and hoping for the Mercy of his Lord"). Instead of singing the praises of universal brotherhood, the surrounding verses distinguish Muslims and condemn those outside the circle of faith. Verse 7 says "If you disbelieve, Allah has no need for you." The next verse says that disbelievers will "dwell in the fire" (of Hell). For good measure, verse 9 states that those who believe are not "equal" to those who "know not." Verse 11 specifically slams the practice of "setting up rivals" with Allah (as polytheists and Christians were said to do). This is in keeping with the theme of the Quran. Verse 39:10 was an early verse "revealed" at Mecca. Later suras, such as the aforementioned verse 3:85 are very clear about people of other religion being denied entry to heaven. Verse 14:18 says that the good works of those who reject Allah are "as ashes" (see also verses 18:103-106). Quran (60:8): Allah does not forbid you to deal justly and kindly with those who fought not against you on account of religion and did not drive you out of your homes. If this verse means that Muslims are told to show justice and kindness to non-believers (as apologists pretend) then why doesn't it just say that - instead of the more equivocal "Allah does not forbid..."? It is because this is not the context - as the rest of the sura makes clear. The verse actually refers to a specific episode in Muhammad's life in which "Allah" was giving permission to break the terms of a treaty signed with the Meccans. Under the treaty of Hudaibiya, Muslims were to return to Mecca anyone who left that city to join them. When two "believing" women showed up, "Allah" suddenly had a change of heart and allowed Muhammad to accept them into his tribe (60:10). It is an embarrassing episode for Islam's apologists because it means that Muslims were the first to break the terms of the treaty. Since the women are said to be "believing", the verse is not even referring to non-Muslims! In fact, rather than telling Muslims to embrace non-believers, the same sura actually warns Muslims against this. Verse 60:1 says: "Do not give them friendship when they disbelieve in that truth which hath come unto you." Quran (109:6): To you be your religion, and to me be mine. If this verse were narrated at a time when Muhammad had the power to impose his religion, then it might be more meaningful. In fact, it was a very early verse narrated when he was in Mecca and had no power. Things were different a decade or so later, when he came back to destroy the idols worshipped by the people - the same idols he refers to in this verse! Scholars usually point out that the real meaning of the verse pertains to distinction rather than tolerance. One of the gods worshipped by the polytheistic Meccans was called 'Allah'. Muhammad wanted it known that their 'Allah' was not the same as that worshipped by the Muslims. Bukhari 83:49: The Prophet said, "Whoever killed a Mu'ahid (a person who is granted the pledge of protection by the Muslims) shall not smell the fragrance of Paradise. This verse from the Hadith essentially means that the life of a non-Muslim is protected as long as they accept dhimmitude - subjugation and third-class status under Islamic rule. By implication, the non-Muslim who wishes to live independent of Muslim hegemony is subject to being killed. This is in keeping with the Quran 9:29, which tells Muslims to fight Christians and Jews until they submit to Muslim rule. Jami at-Tirmidhi 2510: "...You will not enter Paradise until you believe, and you will not believe until you love each other... spread the peace among each other"
Jami at-Tirmidhi 1854: "O Mankind, spread peace and feed people..."
This is how the quote appears in ads placed on buses by the Muslim PR group, Engagement2030. It is meant to create the impression that Islam is about good works and charity, such as feeding the hungry. Unfortunately, the verse is not found in the sahih collections of Bukhari and Muslim, but in lesser sources. The word "mankind" is added to the telling to make it appear as if this is a universal command, although it does not appear in the source. In the Hadith, one version actually goes on to instruct the beheading of disbelievers and another urges the mistreatment of slaves, neither of which seems very charitable. 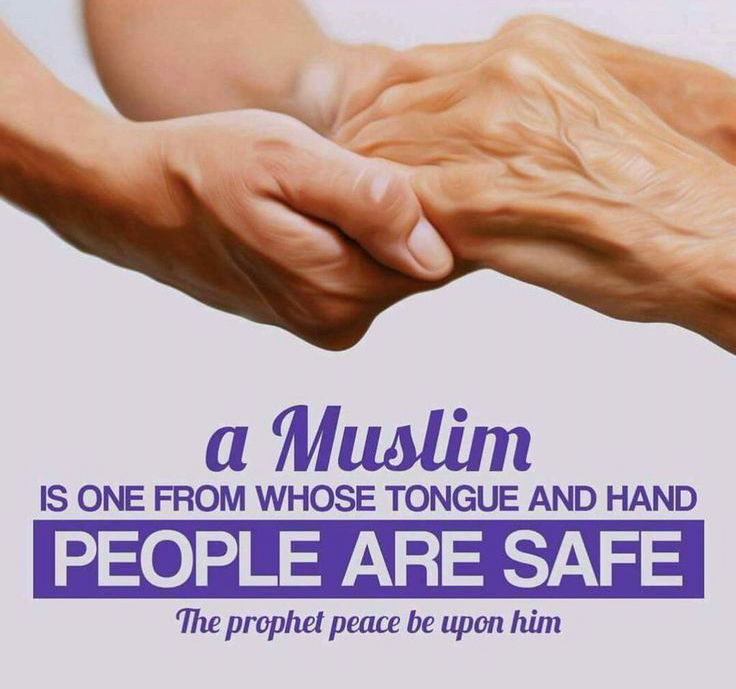 Sahih Muslim 1:65 - "A Muslim is one from whose hand and tongue others are safe"
In the Sahih Hadith collection, this verse actually reads, "A Muslim is one from whose hand and tongue the Muslims are safe." Propagandists substitute the word "Muslims" for "others" or "people" so as to mislead readers into thinking that the verse refers to the decent treatment of all people, when the true reading conspicuously limits such treatment to fellow Muslims. It goes that a Jewish woman in Mecca would throw garbage on the doorstep of the Prophet (peace and blessings be upon him) in defiance of his message, and one day she fell sick and could not throw the garbage, so the Prophet (peace be upon him) visited her. Then it is said that she was so amazed at his character that she realized his prophethood and accepted Islam. This story is often quoted by Muslim apologists to demonstrate the amazingly gracious and tolerant character of their prophet Muhammad. 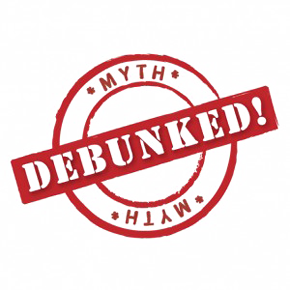 There is no source cited, however, because it is a complete fabrication that does not exist in any historical text. A blind man had a slave-mother [his wife, the mother of his children] who used to abuse the Prophet (pbuh) and disparage him. He forbade her but she did not stop. He rebuked her but she did not give up her habit. One night she began to slander the Prophet (pbuh) and abuse him. So he took a dagger, placed it on her belly, pressed it, and killed her. A child who came between her legs was smeared with the blood that was there. Abu Dawud 38:4348. Other examples of Muhammad's true position on peace and tolerance can be found here. Muhammad said, "There is no superiority of race except by piety and good actions"
This is how the verse appears on a bus ad. Although admirably progressive, it is unfortunately based on a fabricated hadith by Ahamd ibn Hanbal about 200 years after Muhammad died. It purports to be a part of Muhammad's "Farewell Sermon" in 632, and reads, " Indeed, there is no superiority of an Arab over a non-Arab, nor of a non-Arab over an Arab, nor of a white over a black, nor a black over a white, except by taqwa." The real sermon is recorded most reliably by Sahih Muslim, Abu Dawud, and Ibn Ishaq. None of these mention the part about race - although Muhammad made sure to condone wife-beating in his final address to mankind. The true source for this figment is almost certainly Ibn Hanbal's imagination - or that of a later scribe. Ibn Hanbal had a well-earned reputation for fabricating sayings of Muhammad.